"Open Channel D" - it's The Man From U.N.C.L.E. With the cinema screens of the 1960's dominated by James Bond, it was inevitable that the small screen would emulate the 007 phenomenon. 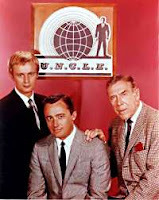 The result was TV's most successful and fondly remembered spy series The Man From U.N.C.L.E. 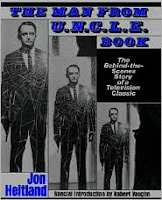 Created by producer Norman Felton, The Man from U.N.C.L.E. 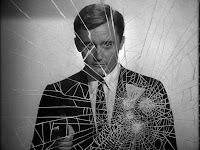 ran from 1964 to 1968 and starred Robert Vaughn as Napoleon Solo (a name suggested by Bond creator Ian Fleming) and David McCallum as Ilya Kuryakin, Solo's Russian counterpart. 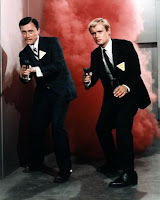 These two super cool secret agents were employed by the United Network Command for Law and Enforcement (U.N.C.L.E.) taking on the dastardly dudes from THRUSH (Technical Hierarchy for the Removal of Undesirables and the Subjugation of Humanity). Solo and Kuryakin reported to Mr Waverley played by veteran actor Leo G.Carroll, somewhat reprising his role as "The Professor" in Hitchcock's North By Northwest. The Man From U.N.C.L.E. format was a title featuring the word Affair in it such as The Deadly Toys Affair or The Vulcan Affair. Like Batman from the same era, each U.N.C.L.E. episode would boast a guest star like Angela Lansbury, Joan Crawford, Sonny and Cher, William Shatner, Leonard Nimoy or Boris Karloff with each act separated by some groovy psychedelic lights. Like the Bond movies, the U.N.C.L.E. spies dressed cool, Solo at home in a well cut suit or a tux while Kuryakin was a black polo neck kind of spy. They also had their own fair share of gadgets, like the U.N.C.L.E. gun, which of course didn't kill people but shot them with sleep darts and a wonderful pen communicator, which every U.N.C.L.E. agent carried, opening all communications with the immortal "Open Channel D"
To take on Bond, several of the episodes were combined and released as feature films, To Trap a Spy (1964) The Spy with My Face (1965), One Spy Too Many (1966), One of Our Spies is Missing (1966),The Spy in the Green Hat (1966),The Karate Killers (1967),The Helicopter Spies (1968) and How to Steal the World (1968). These movies performed relatively well at the box office. The attraction for many British audiences was the chance to see their heroes in colour due the absence of colour TV in this country at the time. 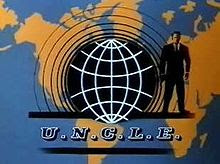 From its relatively serious first season, the subsequent U.N.C.L.E. seasons like the Bond movies, got camper and sillier. As a result, ratings began to falter and despite attempts to liven things up with a short lived spin-off series, The Girl from U.N.C.L.E. starring Stefanie Powers and Noel Harrison, by 1968 it was all over for the super spies. To reflect the hipness of the series, The Man From U.N.C.L.E. boasted a great theme tune composed by Jerry Goldsmith that was adapted throughout the seasons by other composers including Lalo Schifrin and Walter Scharf. The scores for the series are, as one would expect, flash, brash, brassy and sassy, though later seasons accentuated the organ sound to appeal to the kids. It's interesting to note how similar the Lalo Schifrin version of the U.N.C.L.E. theme sounds so similar to the composers other famous TV theme, Mission Impossible. For further reading on the exploits of Messrs Solo and Kuryakin, I heartily recommend The Man From U.N.C.L.E. Book by John Heitland, a long time fan of the show who has assembled an incredibly comprehensive, fully illustrated account of the show's history. The Man From U.N.C.L.E. was the product of a simpler more innocent time that has been lampooned to death through Austin Powers. Nevertheless the is landmark series is still fondly remembered and its like will never be repeated or emulated.